Have you often felt that your child may be too “high functioning” for a self contained ESE classroom, yet he or she is “struggling” in a regular education classroom? If so, our school may be the option for you. 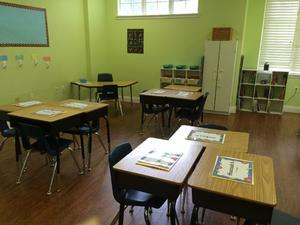 At Alpine Academy, we have designed a specific program to help meet the needs of your child. Our social academic program is designed to meet the particular academic and social needs of students with high functioning Autism, ADD, ADHD, and Specific Learning Disabilities (SLD). Our core curriculum emphasizes carefully planned lessons focused on learning in small increments centered around clearly-defined teaching tasks. We believe by using clear instruction and teaching to mastery, teachers can accelerate learning for all students – high performers as well as students with learning disabilities. Students are placed in flexible, homogeneous groups in reading, language, and math. Students are expected to score 90% or higher on the daily and weekly assessments. Skills are taught and scaffolded along the way so that 85% of each lesson reviews previously taught skills and 15% of instruction is introducing new skills. Students advance through the program only once they have demonstrated mastery of the concepts. Students who show exceptional progress can fast-cycle through lessons if they show continued mastery of concepts. Students are individually assessed every 5 to 10 lessons, and their progress is meticulously tracked by the teacher.